Scroll down to the center of the page to where Image displays on the left side and click the Upload an Image button. The button changes to a box. You can use the box to search your computer for the file you want to upload. After you select the file, Pinterest will upload it automatically. If you’re happy with the image you select, click the Save Profile button at the bottom of your screen. Congratulations! Your Pinterest account has a face! 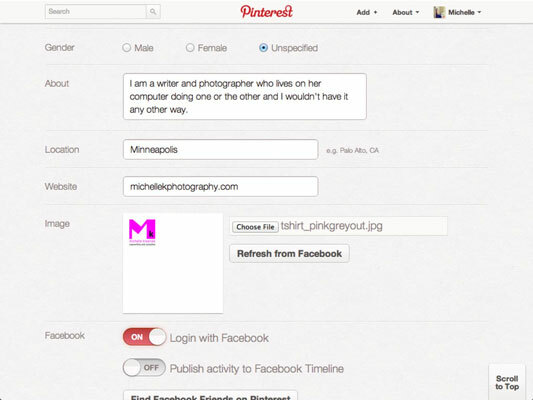 Pinterest also offers the option to use your Facebook or Twitter photo for your Pinterest profile photo. This is a good idea if you want a consistent look among all the social networks.